The Alighiero e Boetti exhibition is at Gladstone Gallery until March 23rd, and I have been twice. My life has been full of so many unexplainable synchronistic events that I don’t know why I should be surprised when another crops up, but my relationship to this artist is one of the spookiest. As I wrote previously, I didn’t know Boetti’s work until my dealer at the time, Frank del Deo of Hirshl & Adler, pointed out that some of my paintings were nearly identical to his. This was in 1995; Boetti died in 1994. Of course I looked up his work, and—yikes!—it was like looking at myself. The configuration, the colors, the stylized letters were the same—the only difference was that the Boettis were embroidered and mine were painted. 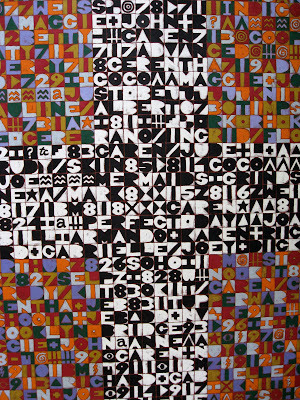 Okay, it could just be those few paintings, but the more I learned about Boetti, the more similarities I found. At the recent MoMA retrospective, for instance, I discovered that he had employed the same way of writing script over script to obscure it that I had, and that he made works with round Avery press-on labels – which I have drawers full. The physical proportion of all of our work is nearly the same. Even the pieces I didn’t do anything like feel familiar, like something I could have done had I followed the thread. This time at Gladstone I found walls full of small pieces that echo a moment in my life when I made small square gridded paintings with friends’ names as gifts….every time I see a piece of his, it’s a shock, like unexpectedly catching a glimpse of myself in a mirror. And what does it all mean? Absolutely nothing. That’s the weirdest part. Carol Diehl, Journal of a Year, 1995, oil on canvas, one panel of four, each 80" x 48"
OGGI VENTICINQUESIMO GIORNO OTTAVO MESE DELL ANNO MILLE NOVE 100 OTTANTOTTO ALL AMATO PANTHEON INCONTRI E SCONTRI (1988), embroidery on fabric; 40 1/2 x 43 1/2 inches (102.9 x 110.5 cm). Courtesy Gladstone Gallery. At the CAA: A lively, meaty panel on “Art Criticism and Social Media” chaired by Phyllis Tuchman, with Walter Robinson, Sarah Douglas, Lindsay Pollock, and Barry Schwabsky, where Walter Robinson tweeted throughout, looking up only to ask, “What was the question?” (I thought it was a hilarious commentary on the topic, although some stuffier members of the audience got their knickers in a bunch about it)…Facebook was compared to a modern day equivalent of the Cedar Bar, but happily more egalitarian and less sexist…one questioner lamented that art criticism doesn’t pay, to which Barry Schwabsky commented that it is a counter to economic rationale, was never really a true profession but something people do because they can’t help themselves….another asked how she could get traffic to her “small blog.” The most prominent Facebooker in the audience generously suggested that she post it on his page (anything that gets attention he leaves it up, otherwise, he takes it down) and there was some discussion of tweets, etc. but no one mentioned CONTENT, which is the way things really happen. You can tweet until kingdom come, but if it’s not interesting, no one will read it, whereas if it is, you can be re-tweeted into history—which is the beauty of the Internet. Again, in another panel, more talk about the “how” rather than the “why” or “what”—this is where I want to start screaming, in Donald Trump fashion, “CONTENT, CONTENT, CONTENT!”—but Lindsay Pollock did address the importance of editors. So much writing on the Web, even when pretty good, lacks cohesion and focus. The irony is that the content that's written with the most thought and care—that in art magazines—gets the least distribution and dies an early death if it’s not archived online. I walked past a booth flaking a “low residency PhD,” which tempted me for a moment, thinking how much fun it could be to go from no degree to a PhD and study theory and philosophy in an organized way, but immediately scotched the idea when I attempted another panel that opened with an incomprehensible presentation by a chaired Harvard professor, a specialist in African and African-American art who, among other flubs, could not correctly pronounce “Basquiat” or “Cote d’Ivoire” (“Bas-kee-yay” and “Coot Deever”—eek!). The CAA job mill was humming, as usual, with interviewees scurrying about or sitting on the floor at the Hilton making last-minute touch-ups to their resumes, but—you read it here—I give the art school bubble another 10 years, maybe only five. With the move from professorships to low-paying adjunct positions, it’s unlikely students will put up with high tuition rates when the only jobs they can expect at graduation pay next-to-nothing and offer neither benefits nor security. At least there will be no need to complain anymore about the academization of art—the academies will simply kill themselves. 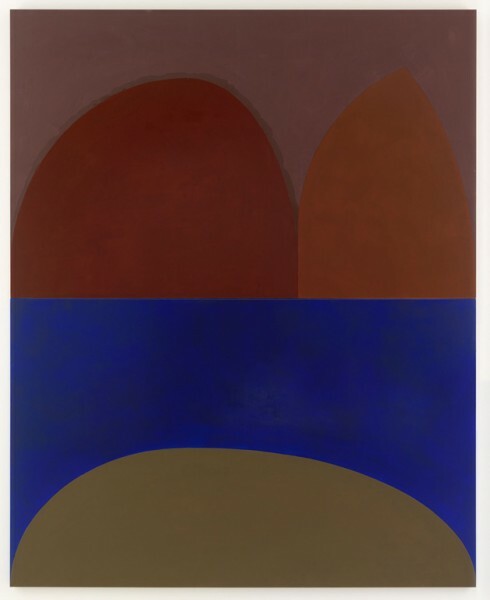 Beyond the Hilton there was art to see: speaking of Basquiat (that’s “Bas-kee-yat”), a humongous museum-style show at Gagosian, Suzan Frecon’s lovely Tantric-like studies at David Zwirner, the sumptuous Boetti embroideries at Gladstone, and a sign of progress at Gavin Brownwhere, at the artists’ request, there were NO press releases available. Hooray! In a June news story that lasted about two minutes, Coldplay were accused of stealing a tune from a rock band named Creaky Boards for their new album—as if Coldplay didn’t have enough songs in their repertoire that they had to nick them. The story was nipped in the bud when Coldplay responded that lead singer Chris Martin was in London the night that he was allegedly seen in New York at a Creaky Boards gig, and that the album, Viva la Vida, on which the offending song appeared, had been demoed months before. While I know ideas do get ripped off, and I’ve actually had them ripped off (a book and an article, and blatantly), I also know that two people can come up with efforts that are spookily similar. My direct experience with the zeitgeist was when Frank Del Deo, my dealer at Hirshl & Adler Modern (now at Knoedler), asked me—this was around 1995—if I knew the work of Italian artist Alighiero e Boetti (1940-94). I didn’t, but sought out his work and when I found it, it was like looking at myself. And, of course, now, I'm a big fan.